The main antagonist of the Additional Content, Manus is a primeval human and may or may not be the Furtive Pygmy himself, whose Humanity went wild. According to Marvellous Chester and Hawkeye Gough, Oolacile awakened him at the urging of a Primordial Serpent. Upon awakening, he flew into a rage, seeking to expand his domain while also seeking out his precious Broken Pendant. His influence corrupted the citizens of Oolacile, whose humanity was warped in turn, mutating them into ghastly creatures. His first appearance is in the Darkroot Basin, where his hand appears from a temporal portal and drags the player into the past. 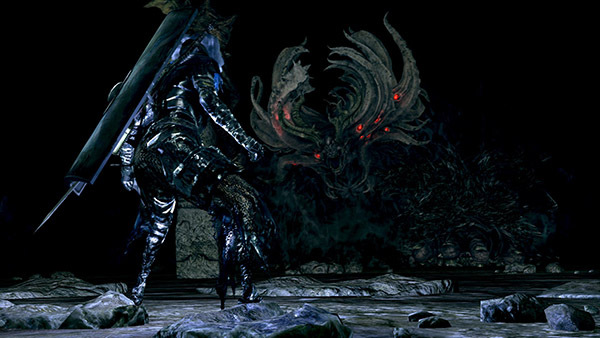 Sometime before the player's arrival into the past, Artorias and his young wolf Sif faced off against Manus. However, Manus was able to overpower them. At the last moment, Artorias sacrificed himself to protect his compatriot. Manus, having defeated Artorias, corrupted him against his will. At the end of the Humanity Phantom-infested area. You need to find Sif behind an illusory wall in the Chasm of the Abyss and save her first to be able to summon her. Her Soul Sign is in the center of the room you fight Manus in, on the lighter grey stone floor within the circle of pillars. Manus has the highest HP of any boss in the game. Sweeps with his giant hand in a wide arc. This can happen at any range, so roll back to avoid it. Slams the ground with his hand. Like his sweeping attack, he can hit you at any range. Reaches around with his hand if you are behind him. Performs a three-hit combo. If you are a melee class focus on strafing him until the final hit of his 3-hit combo. You should be able to get 1-2 hits in on his back. Performs a six-move combo. You can escape from parts of it in a fast moving character with a good shield (+5 Silver Knight Shield, was able to back out of the combo while taking hits maybe 3-4 times instead of all 6, especially easy to dodge the last hit). With a good great shield the whole combo can be blocked (Greatshield of Artorias or Havel's Greatshield) without trouble. His left, oversized hand glows, and will use any three Dark magics: he will launch black orbs at you, summon them from above, or around you. Use the Silver Pendant to deflect his attacks. It is sometimes more advantageous to simply try and block the attack where he shoots orbs straight at you as it is difficult to use the Silver Pendant in time. He will start using his dark magic attacks once he is below 60% HP. It is highly recommended that you obtain the Silver Pendant before facing Manus, thus enabling you to defend yourself against his Dark Magic attacks. The Crest Shield blocks most of his Dark Magic attacks, and the Cloranthy Ring makes sure that one has enough stamina to block most of his attacks. If you do not intend to block his magic attacks, this could be an effective approach using the Silver Pendant (assuming you cannot tell immediately which attack he's going to use): if you are in front of him when you see him start casting magic, immediately roll once sideways (roll to his left if you are already on his left, and vice versa). If it is the cone blast, make another roll and you should be safe. If it is one of the other two magic attacks, go ahead and use the Silver Pendant (remember that you can spam the Pendant continuously). You might want to just use it once then keep rolling backward, away from Manus. That should usually be enough to escape from one magic attack. If you are not in front of him when he starts casting magic, just hack away at him until he releases the spell. If it is not the cone blast, stop attacking and use the Pendant. Without the use of the Silver Pendant, you can dodge his magic attacks by just rolling (his casting animation does vary depending on which attack he is about to use). If it's the cone blast, roll sideways (roll immediately when he starts casting). If it's the attack where dark orbs rain down on you from above, just keep rolling in a straight line and the orbs should miss (but make sure you have enough room in the direction you roll). If it's the attack where dark orbs form a large ring around him then fly towards the center, get close to Manus because there is a small area around him where the orbs will not hit. Alternatively, it is possible to just block the magic attacks with a shield that has good magic damage reduction, such as the Crest Shield, the Cleansing Greatshield, or the Crystal Ring Shield. 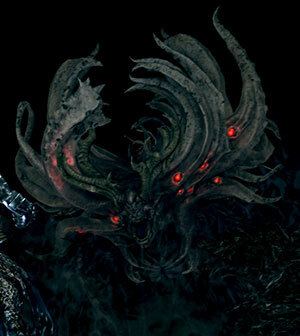 From the right-side ledge in the cave just before the white boss portal that leads to Manus, if you look downward into the darkness, you can see Manus's red eyes glaring back at you. Manus can be damaged before you enter the portal, and damage taken by him remains even after you enter the portal. In short, you can take Manus down effortlessly with a ranged weapon from this ledge. Equip a bow or crossbow and aim at his red eyes. Just be sure to carry enough arrows or bolts with you. The recommended equipment for this tactic with the lowest requirements are: Light Crossbow and dozens of Sniper Bolts, plus the Hawk Ring and Red Tearstone Ring (don't forget to bring down your health below the threshold for the ring to take effect). This guy is extremely aggressive, much like the Flamelurker in Demon's Souls. You'll need a stable shield with 100% physical, armor with some good poise, a decent weapon, and the Silver Pendant if you have not obtained it already. Stamina is key to this fight. Lower your shield to recharge stamina. Do not raise it unless he's about to attack. However, sometimes it's better to dodge his attacks. Strafe him at all times, only pulling back to recover. Note that even if you are behind him, he can still hit you with his hand. When he roars, get away from him immediately; the first half of his six-strike combo can be blocked, but he'll likely smack you around silly on the second half. When you've knocked down a fifth to a sixth of his health, he will start using his Dark sorceries. Use the Silver Pendant to deflect them. If you don't have enough time to use the Silver Pendant (casting time is about one second and the duration of the barrier is about three), either get away from his line of fire when he's shooting Dark orbs right at you or from above, or look for an opening when you're surrounded by a ring of orbs. Take it slow with this guy. If you have Sif summoned, it may make the fight easier, since you can use him as a distraction while you're healing or attacking. Manus has three very strong attacks that can burn a lot of your stamina: 1) He sweeps his buffed-up left arm in a very wide arc from left to right; this attack sends you flying backward even if you block it; 2) He lowers his left arm for half a second then does an uppercut; 3) He raises his left arm, "charging" it up, then slams down on you. If you can block these attacks entirely, then this fight could simply be a test of patience: keep strafing around, blocking, then getting in a hit or two (when you are sure he is not beginning his next attack). Play safe; don't try to get in more hits than you should. Note: the slam attack deals more damage at maximum range, i.e. within his palm. You might be able to block the attack entirely when you're close to Manus, but you might not if you are caught beneath his palm. Safest approach is to either dodge it entirely, or move closer to Manus before blocking it. A spear is a good choice for this fight, due to its long range and good attack speed. It could reach Manus even after he has hopped away from you. Most other weapons will likely miss. Additionally, when you are unsure whether he is about to attack or not, you can keep your shield up while doing a thrust (just remember to watch your stamina). Another strategy is to simply roll through every attack. This will keep you from losing too much stamina, and will make attacking when he is open easier. The Dark Wood Grain Ring is very helpful if you want to be even more safe, and fast rolling is pretty much needed. The dark magic attacks can be rolled through quite easily; for the raining attack, roll backward, for the one where the orbs close in on you, run towards manus, as they don't reach him, and for the horizontal attack, dodge quickly to the left (you may still be hit by one or two of them). Once you have the timing down, you should be able to roll through or simply get out of range of 90% of his attacks. A longer ranged weapon definitely seems to make a difference here, as his opening for attacks can be short. Cast Homing Crystal Soulmass and wait until around a second before it blasts after Manus. When that moment comes, cast Crystal Soul Spear as a follow-up so it hits him directly after the previous spell. With different dexterity levels, the moment you have to cast the follow-up spell may vary. The reason Crystal Soul Spear should hit after Soulmass is that he still gets hit even if he dodges Homing Soulmass. Despite him having more health in NG+, more spells being available will make the fight even easier. Make sure to have light armor to dodge. Summoning Sif won't help much, but will be somewhat more effective than for a melee class for instance. Dark Wood Grain Ring as well as staying below 25% equip load. Black Bow of Pharis helps to do more damage while being farther away, though any bow should work. Silver Pendant for his dark magic. Simply stay just out of his reach. Just keep moving backwards and keep good distance between you. Try to keep in mind where the edge of the arena is and prevent getting backed into it. Also be ready to move around any pillars/debris you might back into early on, until he destroys it all. All his melee attacks are easy to dodge, just roll/flip just before he attacks. Watch for the attack when he raises his arm in the air and holds it there. This is the hardest attack to time, just pause a few seconds longer than normal and be careful that this attack has much more reach than the others. Immediately after rolling/flipping fire one arrow or heal. Patience is key here. When he strafes to the side, fire as many arrows as you can until he starts coming after you again. When he growls and goes for his combo attack roll/flip backwards 2-3 times and start firing arrows until he finishes with his final jumping attack. Once he is under 60% life he will start using his dark magic. Equip the Silver Pendant and be careful to keep an eye on him and roll/flip backwards when he is done as the pendant's usage tends to block your view.